The Magus will screen at the Incubate Festival in Tilburg, Netherlands, which runs September 12 - 18, 2011. Screening alongside The Magus are the films: Invertebrate (James McAleer), Lazarov (Nietov) and The Ill Mannered Milk Man (Wayne Horse). The films will screen at the Film Foyer (Louis Bouwmeesterplein 1) on Saturday, September 17th at 10:00pm. 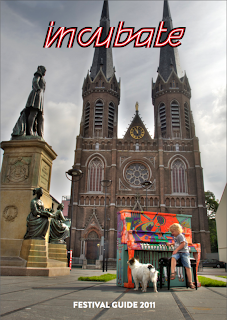 Incubate is the annual celebration of independent culture in Tilburg, the Netherlands. It is a festival exhibiting a diverse view on indie culture as a whole, including music, contemporary dance, film and visual arts. It brings more than 200 cutting edge artists in an intimate context to an international audience. Black metal next to free jazz. Refreshing art next to inspiring debate.